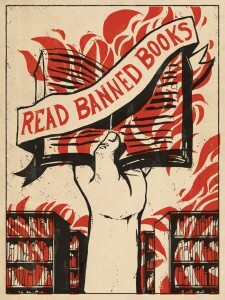 Support Intellectual Freedom- Read Banned Books Aloud! The IUP English Department, in partnership with the English Graduate Organization,IUP Libraries, and the College of Humanities and Social Sciences, will host a Banned Books Read Out in the atrium of the Humanities and Social Sciences Building from 1:00 to 2:00 p.m. on Wednesday, September 28. The Banned Books Read-Out celebrates the freedom to read while bringing awareness to censorship challenges to favorite books and to the ongoing fight to maintain intellectual freedom in schools and libraries across the nation. Students, staff, faculty, and the community are invited to attend. Join us to Read Out your favorite passages from Banned Books—or simply to listen and learn about the censorship issues that affect us all. Refreshments! Prizes! Vouchers! Join us for a lively celebration of our freedom to read. I am looking for volunteers to work an hour or two (or more!) throughout the day at the IUP Career Expo and Graduate School Fair on Wednesday, September 28, 2016. The event is at the Kovalchick Convention Complex once again, and I will need assistance from 8 a.m. until 4 p.m., and as I mentioned it can be in hour or two increments. Volunteers will be needed to greet employers and students, help with registration, assist employers to their booths with their equipment, etc. In the past we have always had such wonderful HC students help out for the Expo, plus it gives them a chance to do some one-on-one networking with the employers. This year we added a graduate school component to the day, and we have 35 programs attending from universities in the Northeast. Also a new feature this year is Career Fair Plus . We are using it in lieu of a printed program, since it can be changed frequently to provide an updated list of registered employers and graduate programs. Please encourage your students to take advantage of this free app. Please let me know if you have any questions, and thank you again for your promotion of our events! The Office of Service Learning welcomes everyone in the IUP community to attend the Community Involvement Fair on Wednesday, September 14, 2016, in the HUB Ohio Room. Students may attend the fair at any time during the scheduled hours; no registration or fee is required. Agencies in the Indiana community are invited to attend to meet with students and share information on volunteer opportunities and internships available at their organization. Agencies registered with the Service Learning Program can also recruit Federal Work-Study employees. Faculty are encouraged to pass this information onto students and help incorporate service learning into more courses on campus. The Office of Advising and Testing is pleased to announce the below slate of events to promote Disability Awareness and, as well, to belatedly celebrate the 25th Anniversary of the ADA! Look for more information coming soon to promote this important topic. Prior to the creation of the Cook Honors College, IUP students had won only two Fulbright Grants for study and research abroad – one back in the 1960s. IUP’s record was similar to that of the other PASSHE schools until CHC students began to raise aspirations among themselves and for other IUP students. Fifteen CHC graduating classes present, among other awards: nine Fulbrights, two Fulbright alternates, five Goldwaters, three NSF awards and an NSF Teaching award, two Marshall and two Truman finalists, a Freeman Asia, a Pickering, a Udall honorable mention, and a Rhodes finalist. This is a truly remarkable record for such a relatively small pool of graduates, which would be all the more remarkable if IUP were able to add to this all of the Fulbright and NSF awards our alumni win in graduate school. Happily, IUP students outside the CHC began to apply for and win these awards as well including at least two additional Goldwaters and two Fulbrights. All this is to say that you all, as Honors College students, are great candidates for these prestigious awards. So Dr. Susan Boser (IUP’s appointed adviser for these types of awards) and I are organizing an informational workshop for all CHC Freshmen, Sophomores, and Juniors to talk about the differences between these scholarships and other technicalities of the awards which you all should know about. Note: if you have any aspiration of applying for any of these awards for post-graduate study and travel in 2017/18 (attention current CHC Juniors!!! ), it is imperative that you attend this informational session. Next week the OIE will kick-off International Education Week (IEW) 2015! There are several programs/events that might be of interest to HC students. In addition, the OIE will sign vouchers to verify student attendance if students want to attend as part of their required program participation. Freshman who have missed a Monday or Wednesday Workshop can attend one of these events to make up for that session. Only one voucher will be accepted per student for this purpose. Will speak on testing (MCAT, DAT, GRE, etc.). Meeting Venue Room 106 in Zink Hall. This is an informational meeting that will give students a better idea about these tests and some free testing materials are also going to provided for ONLY who attend! I hope you are able to join us for some or all of the events and please advertise to your classes, friends, and colleagues as appropriate. For IUP students, attendance vouchers will be available for all activities. The following groups and departments have provided funding thus far for these Latin American fall events: Latin American Studies, University Museum, Women’s and Gender Studies, Robert E. Cook Honors College, College of Business, College of Fine Arts, MARTI/CALSA, English, Foreign Languages, History, Journalism, Management, Sociology. If you would like to contribute to these events please notify me and feel free to email me if you have any questions. Join Brian Jones from the Department of Theatre and Dance for a fun filled afternoon of puppet building. Our first event is Sunday, October 11th Puppet Crafting 1st Session of three–Building the Puppet. The Tlacuilo Honor Society at IUP will be hosting a Day of the Dead workshop this Saturday, October 10th from 2-3 pm in the HUB Susquehanna room. individuals will be able to learn about the history, diversity of celebration methods across and within Latin America, as well as a respectful way to participate in this holiday. There will also be time to brainstorm ideas and plan out what their own altars can look like and revolve around for the upcoming altars exhibit on campus. 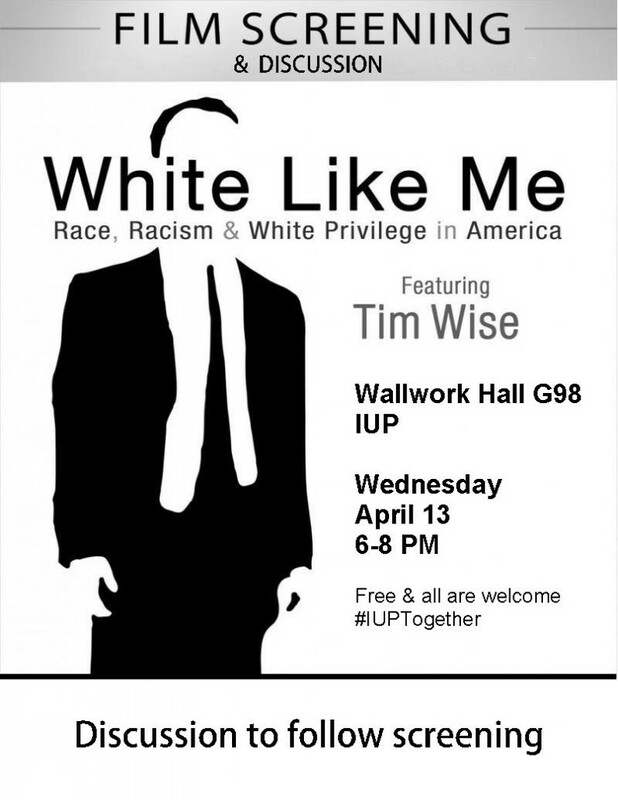 Please direct any questions to email d.morales@iup.edu.